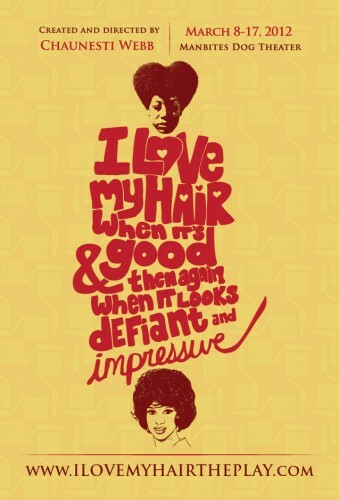 I know that it’s 2012, but it seems like this good hair versus bad hair thing will never die. My mother sent me (ok … really she sent it to Shelli via me) a link to an article by Byron Woods in the INDY WEEKLY regarding a play that is being presented by Man Bites Dog Theater in Durham, NC called, I Love My Hair When It’s Good: And Then Again When It Looks Defiant and Impressive. It looks like something worth going to check out … maybe I can get my mom and/or pop to go and write a review! And this kind of confirms that this HAIRSCAPADES thing is really contagious. Well this in addition to the fact that my father commented on a post last week! Yes, my family loves Shelli and has embraced all things Hairscapades. This looks interesting. A review would be great.